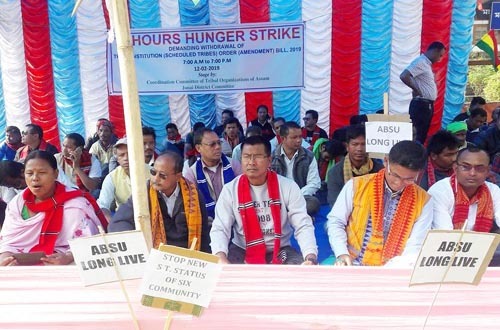 A 12-hour hunger strike is being staged by Co-ordination Committee of Tribal Organizations of Assam (CCTOA) atDhemaji and Jonai sadar on Tuesday. Members of District Tribal Sangha and tribal community organizations leaders are also supporting the umbrella organizations in this protest. The 12-hour Hunger Strike will end at 7 in the evening. The protesters staged the strike in front of Tribal Rest House at Dhemaji demanding withdrawal of the constitution (Scheduled Tribes) order (Amendment) Bill-2019. At Jonai, several members of Jonai District Tribal Sangha with the help of Mising, Boro, Sonowal, Deori and other tribal community organizations sat in the hunger strike in front of Jonai SDO’s office and demanded the authority not to grant Scheduled Tribes status to the six communities of Assam. Talking to media persons, District Tribal Sangha leaders alleged that the central government had made recommendations to grant ST status to these six communities and sent it to the Prime Minister’s office. The protesters fear that 13 existing STs of Assam would be deprived of the rights and privileges if the six communities are included in the ST list. Alleging that reservation for tribal communities is being enjoyed by non-notified and non-ST communities in the state, the Sangha leaders have demanded the government to clear their stand on the protection of rights for the existing tribal groups. 53 district and sub-district committees of All Assam Tribal Sangha were joining the protest. Earlier too, CCTOA and various tribal organizations of the district staged protests in different ways against the government’s move to grant ST status to six advanced Assamese communities.